Execution of Astruc de Léon. A town in the department of Bouches-du-Rhône, France, the Aquæ Sextiæ of the Romans, and for a short period the capital of Provence. It is variously transcribed in Hebrew, and is sometimes translated in Hebrew literature by "'Ir ha-Mayim." 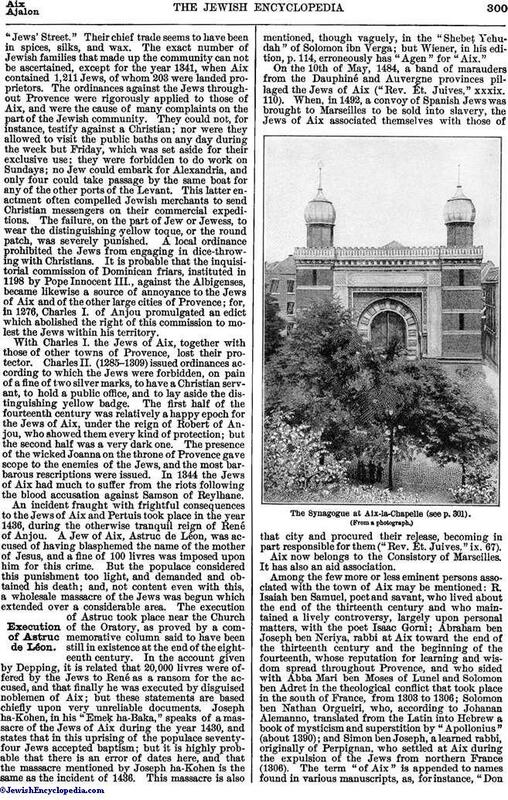 The first mention of Jews in Aix appears in a document of the year 1283, preserved in the annals of the Church of Aix, wherein it is stated that the community, in return for the yearly payment of two pounds of pepper, was permitted to have a synagogue and a cemetery. The greater part of the Jews of Aix inhabited the rue Venel, in the quarter of Saint-Sauveur, which was then known as the"Jews' Street." Their chief trade seems to have been in spices, silks, and wax. The exact number of Jewish families that made up the community can not be ascertained, except for the year 1341, when Aix contained 1,211 Jews, of whom 203 were landed proprietors. The ordinances against the Jews throughout Provence were rigorously applied to those of Aix, and were the cause of many complaints on the part of the Jewish community. 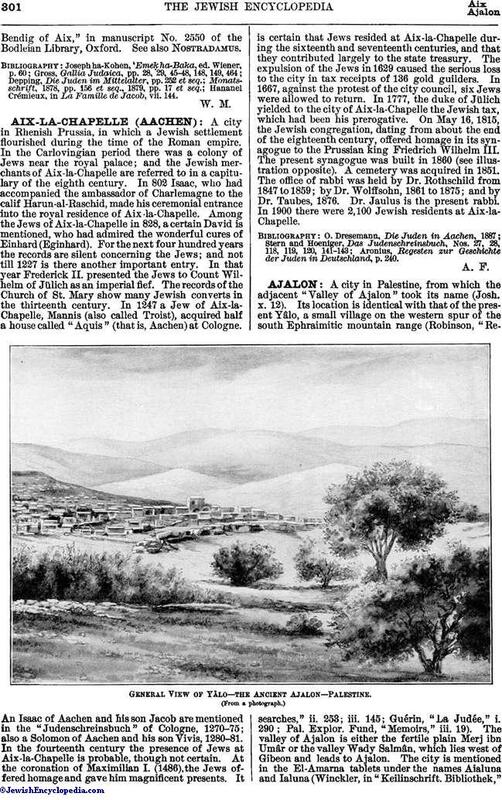 They could not, for instance, testify against a Christian; nor were they allowed to visit the public baths on any day during the week but Friday, which was set aside for their exclusive use; they were forbidden to do work on Sundays; no Jew could embark for Alexandria, and only four could take passage by the same boat for any of the other ports of the Levant. This latter enactment often compelled Jewish merchants to send Christian messengers on their commercial expeditions. The failure, on the part of Jew or Jewess, to wear the distinguishing yellow toque, or the round patch, was severely punished. A local ordinance prohibited the Jews from engaging in dice-throwing with Christians. It is probable that the inquisitorial commission of Dominican friars, instituted in 1198 by Pope Innocent III., against the Albigenses, became likewise a source of annoyance to the Jews of Aix and of the other large cities of Provence; for, in 1276, Charles I. of Anjou promulgated an edict which abolished the right of this commission to molest the Jews within his territory. With Charles I. the Jews of Aix, together with those of other towns of Provence, lost their protector. Charles II. (1285-1309) issued ordinances according to which the Jews were forbidden, on pain of a fine of two silver marks, to have a Christian servant, to hold a public office, and to lay aside the distinguishing yellow badge. The first half of the fourteenth century was relatively a happy epoch for the Jews of Aix, under the reign of Robert of Anjou, who showed them every kind of protection; but the second half was a very dark one. The presence of the wicked Joanna on the throne of Provence gave scope to the enemies of the Jews, and the most barbarous rescriptions were issued. In 1344 the Jews of Aix had much to suffer from the riots following the blood accusation against Samson of Reylhane. An incident fraught with frightful consequences to the Jews of Aix and Pertuis took place in the year 1436, during the otherwise tranquil reign of René of Anjou. A Jew of Aix, Astruc de Léon, was accused of having blasphemed the name of the mother of Jesus, and a fine of 100 livres was imposed upon him for this crime. But the populace considered this punishment too light, and demanded and obtained his death; and, not content even with this, a wholesale massacre of the Jews was begun which extended over a considerable area. The execution of Astruc took place near the Church of the Oratory, as proved by a commemorative column said to have been still in existence at the end of the eighteenth century. In the account given by Depping, it is related that 20,000 livres were offered by the Jews to René as a ransom for the accused, and that finally he was executed by disguised noblemen of Aix; but these statements are based chiefly upon very unreliable documents. Joseph ha-Kohen, in his "EmeḲ ha-Baka," speaks of a massacre of the Jews of Aix during the year 1430, and states that in this uprising of the populace seventy-four Jews accepted baptism; but it is highly probable that there is an error of dates here, and that the massacre mentioned by Joseph ha-Kohen is the same as the incident of 1436. This massacre is also mentioned, though vaguely, in the "Shebeṭ Yehudah" of Solomon ibn Verga; but Wiener, in his edition, p. 114, erroneously has "Agen" for "Aix." On the 10th of May, 1484, a band of marauders from the Dauphiné and Auvergne provinces pillaged the Jews of Aix ("Rev. Ét. Juives," xxxix. 110). When, in 1492, a convoy of Spanish Jews was brought to Marseilles to be sold into slavery, the Jews of Aix associated themselves with those of that city and procured their release, becoming in part responsible for them ("Rev. Ét. Juives." ix. 67). 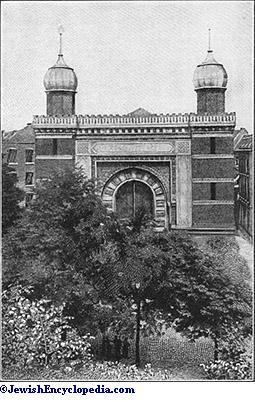 The Synagogue at Aix-la-Chapelle (see p. 301). Aix now belongs to the Consistory of Marseilles. It has also an aid association. Among the few more or less eminent persons associated with the town of Aix may be mentioned: R. Isaiah ben Samuel, poet and savant, who lived about the end of the thirteenth century and who maintained a lively controversy, largely upon personal matters, with the poet Isaac Gorni; Abraham ben Joseph ben Neriya, rabbi at Aix toward the end of the thirteenth century and the beginning of the fourteenth, whose reputation for learning and wisdom spread throughout Provence, and who sided with Abba Mari ben Moses of Lunel and Solomon ben Adret in the theological conflict that took place in the south of France, from 1303 to 1306; Solomon ben Nathan Orgueiri, who, according to Johanan Alemanno, translated from the Latin into Hebrew a book of mysticism and superstition by "Apollonius" (about 1390); and Simon ben Joseph, a learned rabbi, originally of Perpignan, who settled at Aix during the expulsion of the Jews from northern France (1306). 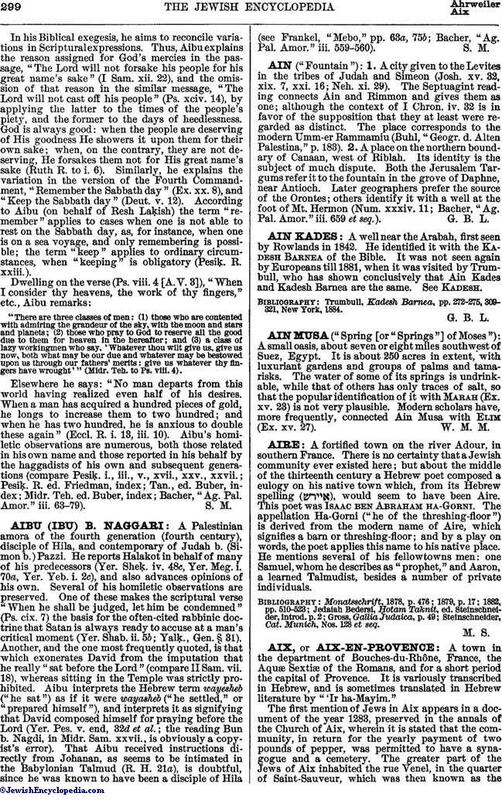 The term "of Aix" is appended to names found in various manuscripts, as, for instance, "DonBendig of Aix," in manuscript No. 2550 of the Bodleian Library, Oxford. See also Nostradamus. Hananel Crémieux, in La Famille de Jacob, vii. 144.